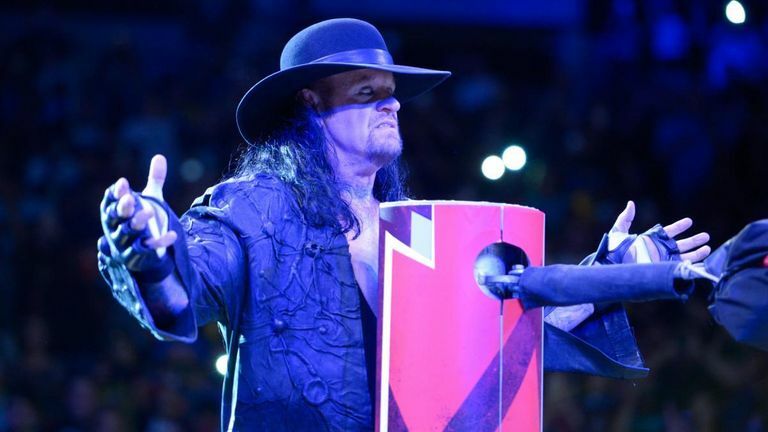 In an extremely rare out-of-character interview, The Undertaker has stressed the importance of forming an emotional connection with the crowd in wrestling. Speaking to Pastor Ed Young as part of his 'Wrastlin' series, Undertaker - real name Mark Calaway - lifted the lid on what he believes is one of the key elements to being successful in sports entertainment. He underlined his belief that competitors who are new to the game should focus more on developing their character and eliciting a response from the audience than doing impressive and athletic moves. "Wrestling and sports entertainment is not about the moves, it really isn't," said Taker, whose on-screen persona is widely regarded as one of the greatest in the history of the industry. "It's about being able to evoke emotion in one facet or another. "You either have to make people love you or you have to make them hate you, it doesn't really matter either way. "If you can't bring that emotion out of your audience then you're not going to have them for long. "What happens with these young guys is they're so athletic and so gifted, they'll do some crazy double backflip off the top rope and land on somebody on the floor and then that's what the audience takes away from it, that this guy does crazy stuff. "But you can only see that so many times before you need something new, and then the person has to up that. They have to keep upping the ante and by doing that you increase your potential for injuries. "So characters like The Rock, (John) Cena, (Ric) Flair, they all had the ability to either make you love them or make you hate them. "That's the key. We use wrestling moves to tell a story but it boils down to the character and being able to bring either love or hate out of your crowd." The Undertaker faces Triple H live at Super Show-Down on Sky Sports Box Office on Saturday at 10am.